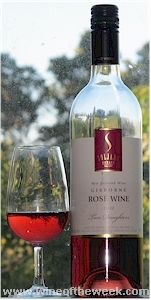 What impressed me about this wine was its pretty watermelon pink colour, its tangy scent and its juicy flavours that quenched the thirst on a sweltering humid January day. Served very chilled, it was the perfect aperitif. That it was made from Pinotage and Muscat, was a surprise. I would never have guessed. But as a long time Pinotage fan, perhaps that why I liked it. The wine smells sweet and ripe with a hint of citrus augmenting the juicy strawberry and cherry scent. That citrussy almost sherbet-like note drives through the medium-bodied palate where strawberry, cherry and watermelon flavours abound. A hint of tarragon adds a lovely anise inflection with more summer herbs on the finish, which, despite the 10 grams per litre residual sweetness in the wine, seems quite dry and has a very pleasing spicy tang. And the juiciness lingers in the mouth long after the wine is swallowed. The Pinotage grapes spent four hour on skins to impart the pretty colour and a small portion of Muscat was added to enhance the aromatics and add some natural sweetness. It has 12% alcohol by volume and RRP is NZ$17 a bottle. Soljans Two Daughters Rosé 2010 is named for Lisa and Tonia, the daughters of Tony Soljan, winemaker and owner of Soljans Wines. Since 2003 it's been called 'Two Sisters', but someone (possibly a winery in Central Otago, or a winery in California) said they couldn't use that name, so the 'Two Daughters' were reborn. If you are in Auckland, what could be better than driving northwest to the Soljans Winery on Stage Highway 16, Kumeu, and relaxing in their courtyard with a chilled glass of Two Daughters Rosé and an antipasto platter from the winery café. Check out www.soljans.co.nz for more.